7 times World Cycling Champion—77 times British Champion. 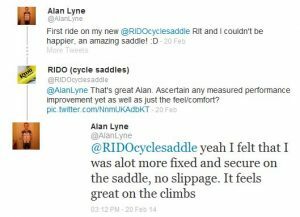 “Hi, just got in from another wet and windy training ride and thought I’d let you know how I’ve been getting on with my RLt saddle. My main focus is with mountain bike marathons & events 60-100 miles but I spend the majority of my time training either on the road or indoors on the trainer. I’ve had problems with numbness on the bike for years, especially after a long ride as the numbness would sometimes remain until the next day. “I’ve tried a lot of big brand saddles at huge expense, these have been of the usual high quality you would have expected from such expensive saddles but just not suited for me, some better than others and some pure instruments of torture. I finally settled on a particular saddle for my bikes which was the best out of all the ones I’ve tried and stuck with it for years. Still I was getting issues though even with that saddle, especially after a long ride on the road bike in which you remain seated for a long time during a ride unlike a long ride on the mountain bike off road where you tend to move around on the bike more. “It arrived the very next day. Quality and the weight is on comparison to a fair few high-end saddles I’ve tried costing twice the price and in all black it looks the part too. I couldn’t wait to fit it to my road bike ready for that evenings session on the trainer. 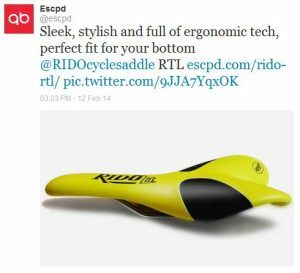 My go-to test for any saddle is at least be able to remain seated through a twenty minute interval with no numbness. After an initial period of adjustments I have found I like the saddle slightly nose down but because of this I sometimes find myself slipping forward a tad so I have to consciously reposition my backside. For me this is not a big deal and I found it mainly to happen when I’m pushing hard on the pedals. I also found I had to lower my seat post more than I thought as I found I was now sitting on the raised portion of the saddle (my initial measurements had been to the centre of the saddle as I’ve done with all my other saddles). This extra height aggravated an old knee problem but thankfully I was able to resolve the problem. “When first sitting on the saddle it feels a little like you’re sitting on two tennis balls and takes sometime to get used to, but you can certainly feel the weight on your sit bones. I have to say that since early December 2012, after over 600 miles and thirty hours of use the only major numbness I’ve experienced has been to my sit bones after a prolonged period where I’ve remained seated, I put this down to the saddle being pretty hard and the fantastic quality of the roads in the UK over winter. Two hour sessions on the trainer, no problem, I can easily sit through a twenty minute interval now and five hour rides on the road are much more enjoyable, but the best thing is that I don’t have a reminder the next day that I’ve spent some time on my bike. “Perhaps, however, I got carried away too quickly. Coming off the sedan chair comfort of the R2 any racing saddle was going to feel hard and – although the LT has some give in it as pressing down with a thumb reveals – one of my sit bones did, after an hour, begin to feel it. I was hoping this, like anything new, would only be a matter of adaptation – a couple of days rest and the tissue surrounding the sit bone would harden up. Happily I was proved right. 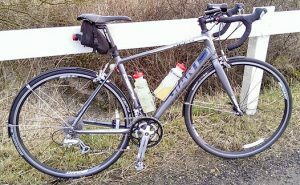 The next ride – with the club a week later – was a three hour one. Again it’s a matter of getting used to something different but by the end of the ride I had completely forgotten about the saddle – which is, of course, the ultimate accolade for any saddle. But, my club mates hadn’t. They kept complimenting me on its stunning looks – something I don’t think comes across in the photos. That and its complete lack of pressure on the perineum area makes it exceptional. I also like the smooth surface which I think helps prevent any sores arising from chafing. So expect more interest from me and my clubmates in the future. Fred, by the way, is very pleased with his. He sent me a photo but it wasn’t good enough to send on. I’ll try and get a proper one done without offending his ego. 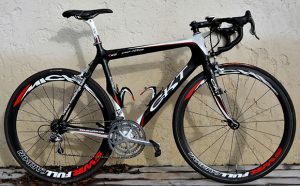 Sadly there is still no sign of the missing LT. A pity because one of my clubmates wanted one to try out straightaway. “At last, a photo for your site. 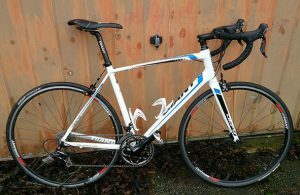 This is my Sunday best ride – cobbled together on a budget, but light and ridiculously quick. I was hoping to write after having totted up a few more miles so I could give you a more informed view. But, the weather has been so awful it hasn’t been possible – photo taken in a rare five minutes of sun. Nevertheless I thought I’d let you know my findings so far on the LT as goodness knows when our next dry day will be. The forecast is appalling. The worst January/February I’ve ever known down here… Anyway, instead of bemoaning the odd soaking or two as if we’re entitled to nothing but sun on the Riviera I’ll get on with it. “Having ridden nothing but an R2 for the last four years – my impression in the first few seconds was gosh, where’s the rest of he saddle gone? However, with the nose raised a fraction to stop myself sliding forward, the LT felt well, not far off perfect – particularly its shape. In fact, after ten minutes an involuntary smile spread across my face. Yes, this is good. Very, very good. “Morning. Feedback is easy. My new bike came with a ‘board’ for a saddle which was incredibly uncomfortable. I bought an RLt and it’s wonderful. I don’t even feel it until about 40 miles, and then with a minute standing I can ride another 40 miles without feeling it. Apart from falling off and tearing its side, it still looks good and I’m forever recommending it to friends. 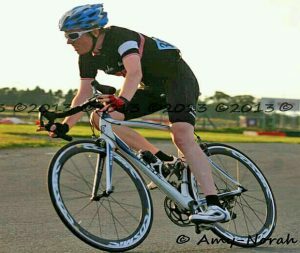 (3) “Just thought id let you know that I have done a good few races so far and that the saddle is going fantastic, I did a 2 day race last weekend and had no sores of any sort! Its also been getting a few looks at the races. Its fantastic at high cadence. 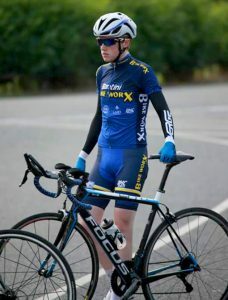 (4) “I got my first result of the season today coming 4th on a Hill TT which I was very surprised considering I’m usually awful at TT but the saddle design helped to drive it up the hills I think. I also recently did a solo 170k TT to try do the ring of Kerry in under 6 hours (5h50m to be exact) and I was amazed by how much the saddle kept me comfortable. It was the longest cycle ive attempted and was in the unknown for how I would survive but thankful because of the rlt I did! “Hi! I got a RLt. I am a leisure rider. 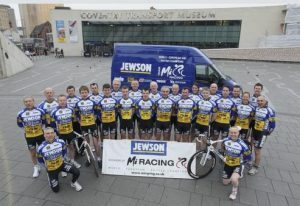 I love cycling. If possible, will do it twice a week. Buy before always felt sore in my bottom after cycling. But now it’s sore-free. I love the RLt very much. 100% satisfied. I would recommend to my friend. Attached is my bike. 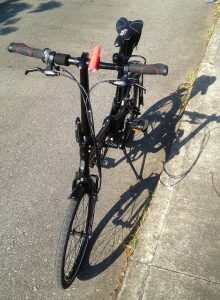 It was a tern folding bike.